Dr. Amy Taunton DeFries is certified to perform PennHip radiographs. The AIS PennHIP method has strong scientific foundation as the most effective hip screening tool available for dogs. AIS PennHIP testing is accurate in puppies as young as 16 weeks of age. 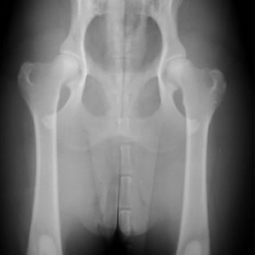 It gives an estimate of the risk for painful osteoarthritis (OA) of canine hip dysplasia (CHD) later in life. With this information, preventive and palliative strategies can be recommended by the PennHIP-trained veterinarian. All dogs can benefit from PennHIP testing. For pet dogs found to be at risk, early intervention can help prevent or lessen the severity of CHD. For working/service dogs, identifying a dog with healthy hips can extend the working life of the dog. For breeding dogs, early detection of at-risk hips can allow the breeder to make early, informed decisions as to which dogs to keep in breeding programs.